The life of Tomoya Aki, a high school otaku working part time to support his BD hording. With remarkable luck, he bumps head-first into, Megumi Katou, the most beautiful girl he has ever seen. Naturally, the meeting twists his life into a complicated torrent of relationships. Eriri Spencer Sawamura, his half-foreigner childhood friend who's always valued her relationship with MC. Utaha Kasumigaoka, a cold, composed renowned literary genius who shoves everyone aside from our protagonist. What is this? An eroge introduction? 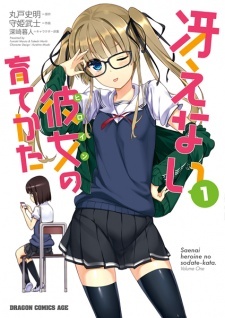 Saenai Heroine no Sodatekata was published in English as How To Raise A Boring Girlfriend by Yen Press from January 26, 2016 to December 19, 2017. Story: it's interesting how in the spin-off aki forms a doujin circle and how in this one he becomes the editor of kasumigaoka. The story of this manga kinda reminded me of the anime "shirobako" because of the part of the story when one of kasumigaoka's light novels was planned on being adapted to an anime (not gonna say which one to decrease spoilers. ).